You finally get your dream job, managing a new art gallery in New York. You go to work one day, unlock the door and not only is all of the art off the walls but the entire space is empty. Except for your dead boss! That is what happens to Alice Humphrey, the main character in Long Gone. Needless to say she becomes the primary suspect in his death especially after the police find a photograph of her kissing Drew, her dead boss. Alice denies everything but they have a picture of HER kissing Drew. At the same time, a teenage girl is missing and the last place she was seen is also the art gallery. Alice tries to clear her name but the evidence is quickly piling up against her. Hank Beckman, an FBI agent, works with Alice as he has his own personal interest in the case. Alice's parents are famous, her father is an award winning controversial film maker and her mother is a one hit wonder actress. But Alice has worked hard to stand on her own and not rely on their help. Long Gone has other great characters as well including Alice's brother who is a drug addict, her best friend Lilly, a preacher and his flock who protest the art gallery for questionable photographs, the strange artist who can never be reached and the family lawyer. Alice ends up leaving town after an arrest warrant is issued for her. Hank and Alice working together search for various clues, read reports and conduct interviews. There are several parallel story lines within this book which I personally enjoyed. The last 50 pages is filled with so many turns and twists, but I loved it. Just when I knew for sure I had it all figured out, Alafair Burke surprised me and went in another direction. The writing is fast paced, gripping and like Alice you cannot believe how it ends. The theme of this book is secrets not only those we keep from the world but those we keep from our family, our friends and even ourselves. Alafair Burke is an attorney turned author. This is her first standalone book. She is best known for her series featuring NYPD Detective Ellie Hatcher which I have also read. 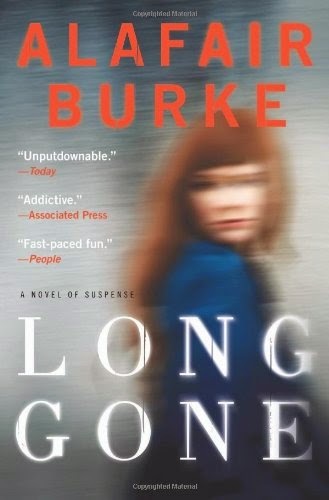 Alafair Burke creates strong, likeable female characters and Alice in Long Gone lives up to that. I love Alafair Burke's series, and this standalone sounds really good. Putting it on my list to read.